Made from organic, composted materials, Root Riot Propagation Cubes retain the ideal water/air ratio for rapid and healthy growth. This revolutionary product is suitable for both seeds and cuttings. As they are infused with biologically active ingredients and micro-nutrients they are able to aid in root development while providing proper nutrients to your growing plants. 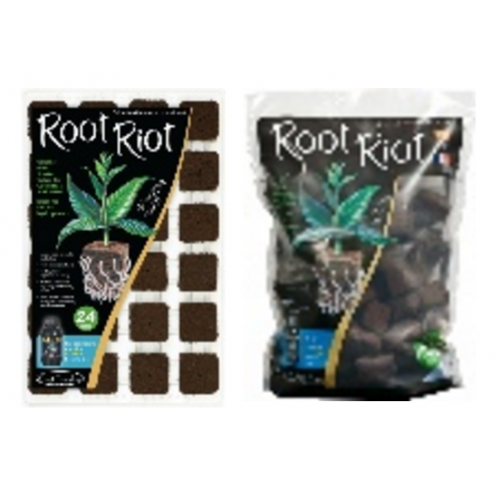 Root Riot Cubes are composed of sphagnum peat moss which has been delicately and finely milled, to provide a superior starting environment for cuttings, seed and even acid-thriving plant clones. This design allows more excellent air movement, ease of root penetration and outstanding water-retaining ability even after your plants have been transferred to other growing environments. Root Riot Cubes will easily fit into 50 compartment trades that come as part of the system. You will soon discover that the Root Riot system allows for the optimal environment for both root initiation and development. Choose desired cutting material and cut diagonally below the stem swelling or node. Take off the bulk of the leaves, with just a few remaining. Mist the cuttings with Clonex Mist, cover with plastic bag or a clear lid as this will help to boost humidity. Mist regularly during the growth process.